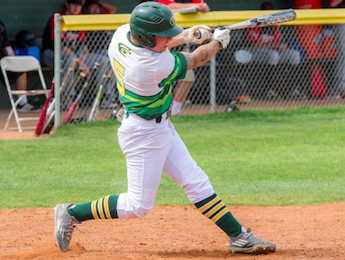 SAN DIEGO – Pacific Coast Athletic Conference Player of the Year candidate DAVID MALDONADO helped the Grossmont Griffins pass their first major hurdle of the conference season in a 15-7 pasting of host San Diego Mesa Tuesday afternoon. The Griffins rallied from deficits of 3-0 and 7-5 before putting away the Olympians with a six-run seventh. Maldonado had three hits, scored three runs and hit a two-run home run to cushion the lead in the eighth inning. The 5-foot-8, 175-pound sophomore pays off at the plate with his avid work in the weight room. Talk about the power and speed combo. 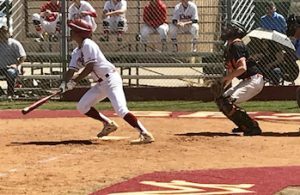 A leadoff batter, Maldonado is second in the PCAC in RBI with 32, second in the conference with five homers and also second in the conference in stolen bases (13). The centerfielder has even thrown in a couple of outfield assists this season. 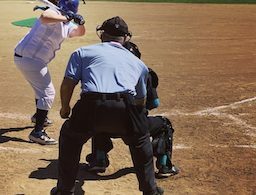 Grossmont (12-1 PCAC, 17-6-1) handed Mesa (7-3 PCAC, 12-12) a key loss in the Olympians’ pursuit of the Griffs and co-frontrunner Palomar (11-1 PCAC). After Mesa took a 3-0 lead in the bottom of the first, the Griffins put up markers in the next three frames. However, the hosts would take the lead back in the bottom of the fifth with three more runs. JUSTIN BURKEY hit an RBI double to left-center, then CABOT VAN TIL drove home two with a single to center to tie the game, 7-7. NOAH STROHL added a sacrifice fly and Maldonado scored on a passed ball. Van Til had an RBI in Grossmont’s two-run second, while Burkey finished with three hits and two RBI. Grossmont freshman JALE SIM, from Scripps Ranch High, scored four runs, getting two hits, including a triple, and walking twice. 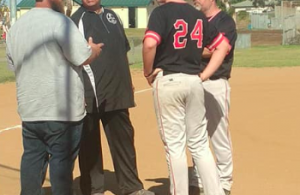 Griffins reliever HAYDEN SHENEFIELD (2-0) got the win, while JAVIER DE LA TORRE was Grossmont’s most effective pitcher, dealing two scoreless frames in the seventh and eighth. The series concludes Thu.-Fri. with a home-and-home, starting at Grossmont. Both games are at 2 p.m.